This is the 3rd chicken coop I have built. 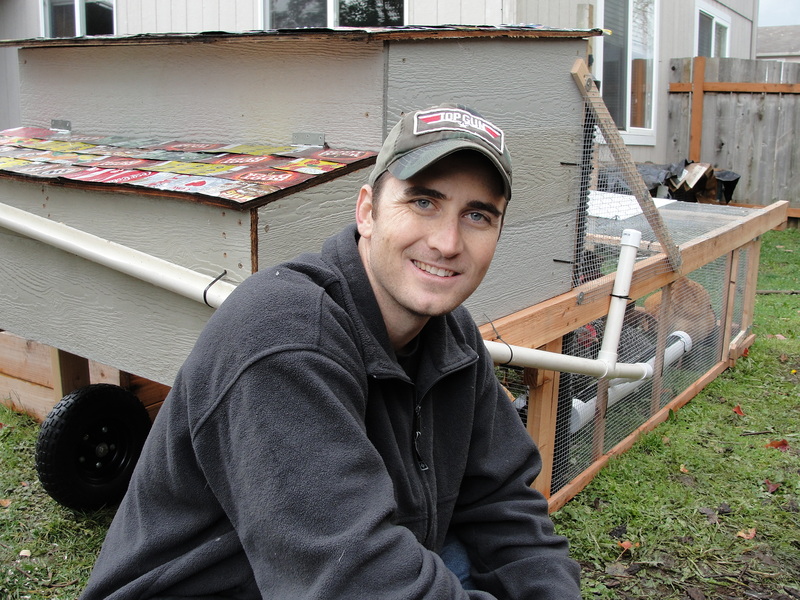 I combined and modified many techniques from the Internet into a design that makes taking care of chickens MUCH easier based on my own experience. Let me point out a few key features of the coop. Here in Washington it rains all the time, so I wanted to turn this into an asset for my coop. I’ve had a problem in the past catching rain water off of shingles as the water ends up picking up a lot of tar residue. 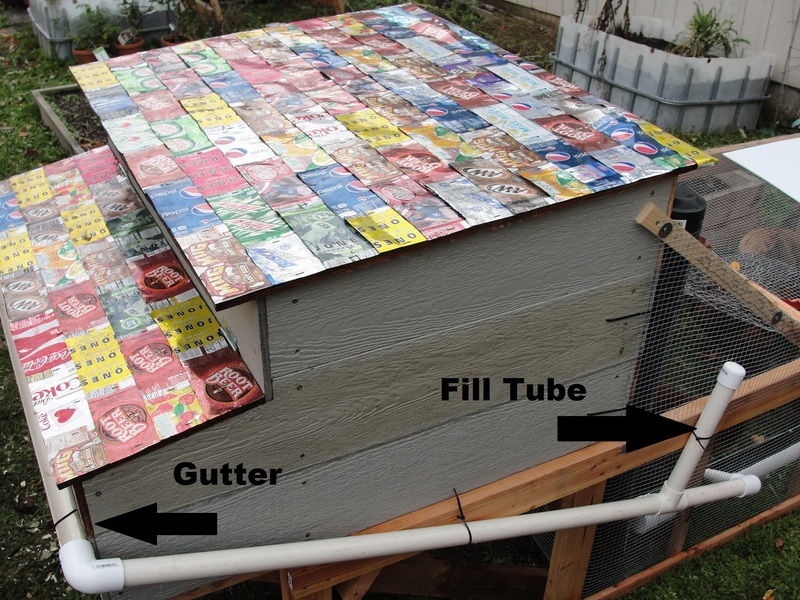 The roof is made of cut up soda cans so that I could have a metal roof and avoid contaminating the water. Most people can find aluminum cans for free so I figured they’d be a good construction material. The rain water runs down the gutter, and into a trough located inside the chicken tractor. The trough is fairly big so it hasn’t had a problem with too much overflow. The small amount of overflow from large rainfall isn’t causing any issues thus far. 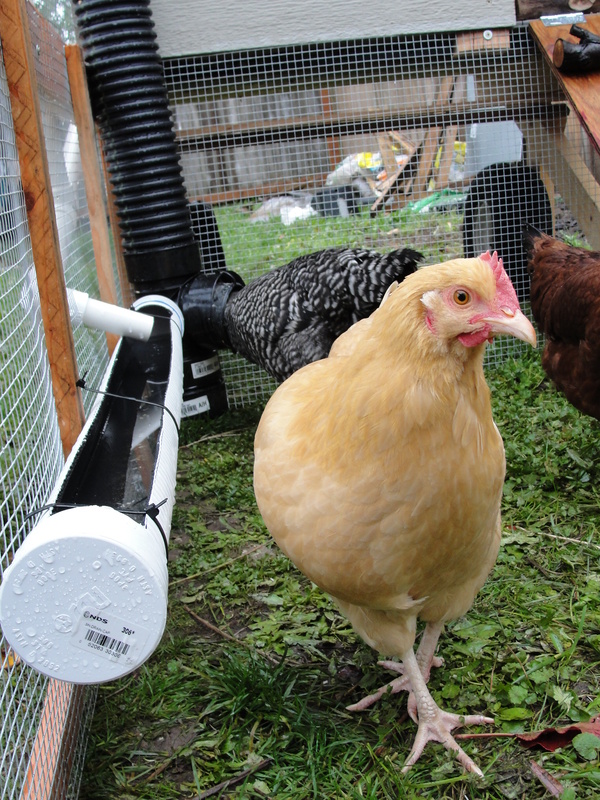 In the background you can see one of the chickens sticking her head into the automatic feeder. This is made from sewer pipe found at Home Depot. There is a 90 degree elbow inserted in the “T” section on this pipe that prevents the feed from spilling out of the pipe. 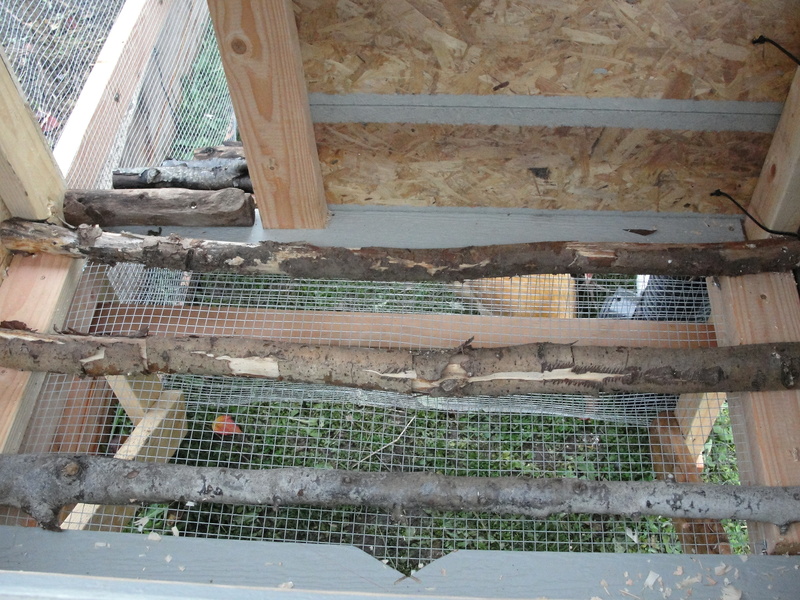 The roosting bars have hardware cloth beneath them to prevent predators from getting in but allow for poop to be washed through. There is a metal tray that slides in beneath this to catch chicken poop and to prevent a draft during winter months. 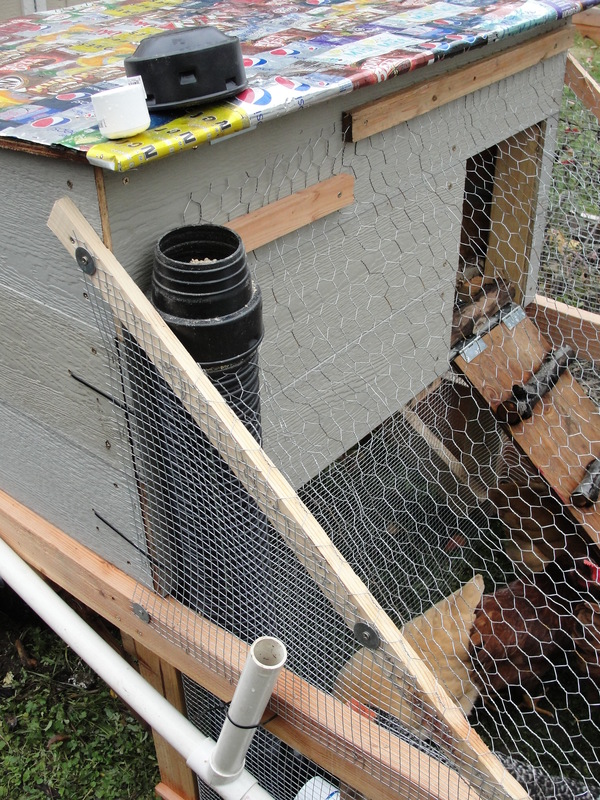 You can fill the chicken feeder and water trough through the openings shown in this photo. I pour feed straight down the tube and can stick a hose into the PVC pipe if it doesn’t rain. 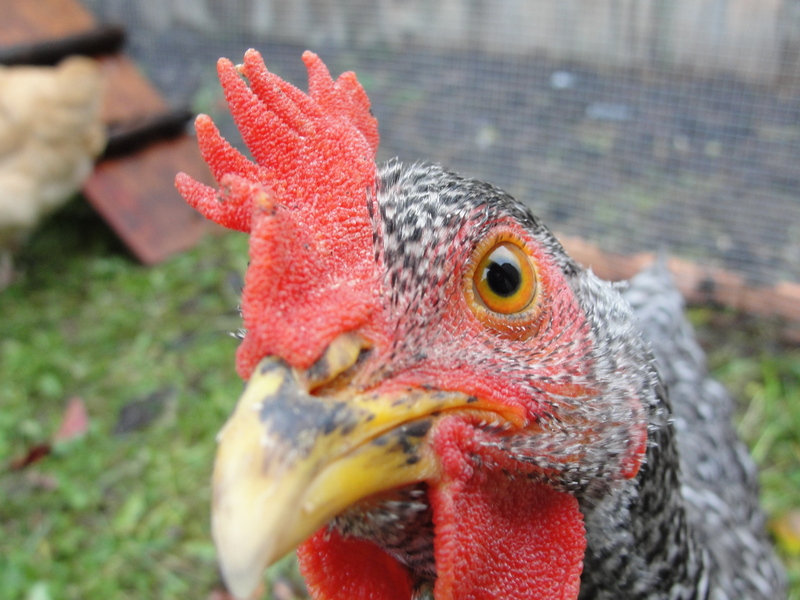 In my last coop the chickens were pooping in the nest boxes. When I washed them out with a hose the poop water would build up in the corner and soak into the wood. Not cool. 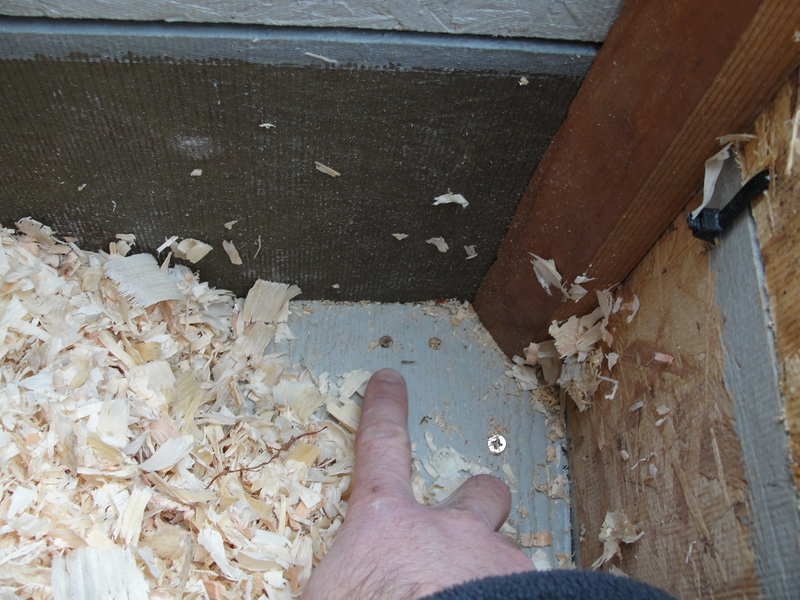 Drilling holes n the corners will allow the poop water to drain if this occurs again.